As a milk supplier, we are often contacted regarding the welfare of our animals and asked both how and where we source our milk supplies. Here are the answers to our most commonly asked questions. Where does your milk supply come from? We source our milk from farmers across the region, and the vast majority of our milk suppliers house their cows in sheds during the winter months, where they sleep in cubicles of straw bedding. During the drier months, the cows are outside eating fresh grass. Cows, being mammals, need to give birth before they can produce milk and therefore if a male dairy calf is born, unfortunately then it is of no use to our milk suppliers. These calves are sold to market for beef. Are our farmers' cows regularly given antibiotics or hormones? Cows are sometimes given antibiotics if they exhibit signs of mastitis, as this is the best way of dealing with udder infections. Even organic cows are given antibiotics in these circumstances. However, they are not routinely given antibiotics, growth hormones or any other kind of artificial stimulant and any milk from a cow treated with antibiotics is removed from the food chain until the antibiotic treatment has finished and is no longer present in the cow's system. 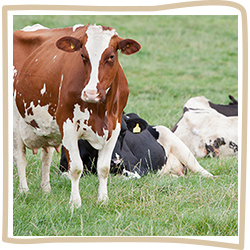 - details the standards that our dairy farmers have to meet on all aspects of their operation, including animal welfare, housing etc. Our farmers are independently audited on an annual basis to ensure that they are maintaining these standards and we don't take milk from farms that don't comply. If you have any further questions regarding our milk supplies, or about the high standards we require from out farmers, please contact us.